A sudden rush of activity around Malamulo Hospital piqued my curiosity. What is going on? I wondered. A sudden rush of activity around Malamulo Hospital piqued my curiosity. The potholes in the road from town were being filled. The “Malamulo Mission” sign was getting a fresh coat of paint, and small cracks in the sidewalks were being repaired. What is going on? I wondered. Wow, the president of Malawi! I thought. I pictured our three sons, Benson, Hudson, and Jett, and myself standing outside our gate, waving as her convoy passed by. Jason Blanchard, our chief executive officer, asked if I could take pictures for the hospital’s records. “Sure,” I replied casually, envisioning myself snapping a few shots from a distance. On Tuesday morning I donned a dress and walked to the hospital with our sons. “Will we see army guys?” Benson asked. Just as he finished his sentence, a truck of soldiers whizzed by. “Cool,” he muttered. Jason introduced me to the press agents for the president. One of the men handed me a badge with the word “Press” on it. “With this pass, you may take pictures and move around freely,” he said. I looked at Jason who just raised his eyebrows and smirked. I felt like a paparazzi impostor as I pinned the badge to my dress. I hovered around the man who had handed it to me, but he urged me away. “You may move around,” he reiterated. I took the hint. For the next hour and a half before Her Excellency arrived, I snapped pictures, trying to capture the mood as dozens of dignitaries greeted each other with handshakes and smiles. The convoy entered the gate and the press began jostling for position. I realized that if I was going to get the pictures Jason wanted, I too had to vie for position—elbow for elbow, nudge for nudge. I leaned on the back of an experienced photographer, willing my camera into position, hoping to obtain at least one focused picture of the important moments. As President Banda exited her vehicle, a slew of security agents descended on the red carpet, ushering her forward. Bodyguards seemed to drop out of the sky. The movement was rapid. It seemed like only seconds passed and the red-carpet entrance was over. I apologized to the photographer in front of me for practically riding on his back down the carpet. The head of the president’s protocol office controlled the press and the speed of the event. I learned quickly to watch him for cues. As the president entered the hospital, the doctors and nurses standing in line in the general ward snapped to attention. A choir sang, and the voices echoed down the corridor as the president approached. I fired away with my camera, but the lighting was bad. My little built-in flash was struggling to keep up with the external mega flashes of my competitors’ cameras. Keep shooting, I told myself as the press pushed from every side, hoisting cameras in front of my face. Don’t flub it up! Don’t miss the handshakes! I moved the camera up and down, trying to get the best lighting. I edged forward, pressing the button with vigor. The introductions concluded and the party proceeded down the ward with haste. A burly bodyguard crossed in front of me, blocking my path into the wardroom where my husband, Ryan, was presenting patients to the president. I can’t believe this! I thought. I’m not even in the room. With a racing heart, I tapped the bodyguard on the shoulder and presented my press badge. “Er, excuse me, sir,” I started. “I’d like to get into the room.” He moved to the side, and I squeezed by, relieved to have an opportunity to photograph the president’s first patient visit of the day. At the maternity ward, I secured a favorable position for shooting and started to breathe a little easier. I even enjoyed watching the president interact with the patients and staff—she often shared a joke or a smile with those on the ward. Listening to her speak, I forgot momentarily that I was “Press.” Suddenly, I realized the party was getting ready to move, and the head of protocol was staring at me, trying to speak with his steely eyes. I popped out into the hallway, falling behind the main press again. It was difficult to shoot photos in the crowd, but I managed to position myself well enough to get shots of the main events. I just got used to being part of the official press when the head of protocol swooped over and snatched the badge off my dress. I’ve done something wrong! I thought. But then I realized that we’d come to the end of the tour. I wasn’t allowed to walk with the party to the president’s car, so I sauntered behind the soldiers and poked my camera out of one of the arches and waved to Her Excellency as her Land Cruiser rolled away. 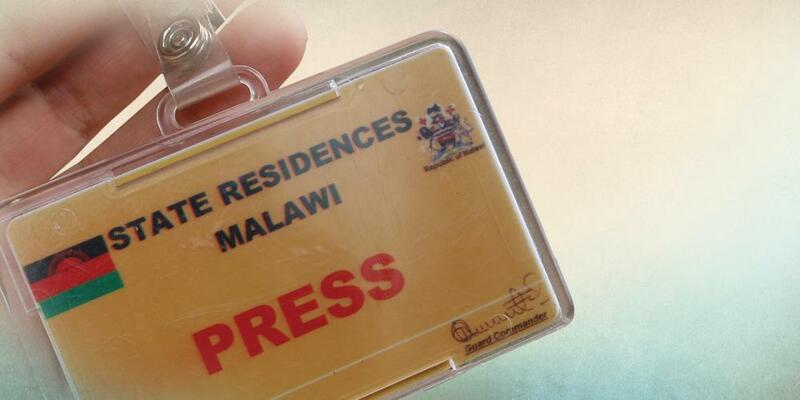 In a glorious whirlwind, my day as part of the official press for Malawi was over. I was back to being a stay-at-home mom of three boys—back to being a housewife, a hostess, and a t-shirt-and-jean-wearing nobody. I decided that is the way I like it. Sharlene Hayton grew up in Australia, married an American, and serves at Malamulo Hospital in Malawi, supporting the medical work of her husband and raising three sons.